Many international organizations have indicated a constant and forceful decline in freedom of the press in Bulgaria in recent years. Do you agree with this assessment? It is hard not to agree with an evaluation that comes in such a coherent way from so many diverse sources and is based on solid empirical data. However, it is not easy to pinpoint the reasons for this decline. The media is never an isolated element. Rather it is part of a complex setting, in which political, economic and cultural factors participate. Nevertheless, I believe that we can pinpoint two principle factors. On the one hand, there is the pressure and influence on Bulgarian media from the political and economic establishment that leads to self-censorship. On the other hand, there has been a rapid cultural decline in the media with a progressive movement towards superficial topics to the detriment of more profoundly researched pieces. Did this marked decline in the media transpire after the entry of Bulgaria into the European Union…. I do not believe that there is a direct relationship between Bulgaria’s European membership and the decline in liberty of the press in the country. Rather there in recent years there have appeared much more aggressive “players” in the information sector who are happy to subordinate media outlets to their economic and political interests. But the European Union has the means to reverse this tendency? In the current state of affairs, it appears that Brussels’s possible means of intervention in this sector are still few and not very effective. There’s talk of a future harmonization of media norms between the member countries, a step that would certainly be positive for Bulgaria. The problem, however, remains that of the (lack of) application of these norms. I believe that the EU’s influence on Bulgaria will be principally political in character. Especially since the classification of Bulgaria at number 100 on the 2014 list put together by Reporters Without Borders presents an image problem for the EU. Given the significant lacuna in media regulation, there have been attempts to introduce mechanisms of self-regulation. Nevertheless, the results have not been outstanding. How come? Nonetheless, these processes have led to a profound change in the media universe in Bulgaria, with the creation of media conglomerations in fierce competition with one another and that are mirrors to the political divisions in the country. We have arrived at a present situation in which it is impossible for all the various media actors to coexist, from the editors to the journalists, within the same setting. Consequently, at the start of 2014, a part of Bulgaria’s media, assembled around the Bulgarian Media Union (BMS), gave birth to its own ethical code, an alternative to the code signed in 2004 by the Bulgarian Editorial Union. As a result, Bulgaria is probably the only country in the EU to have two professional ethical codes for journalism. Unfortunately, both are of a very limited efficacy. Why are Bulgaria’s journalists working so hard to organize the defense of their own interests and the liberty of expression? In Bulgaria, the union movement is in a general phase of crisis. In the field of journalism, the difficulties both stem from historical motives, and are due to the fact that the profession is extremely divided politically. For these reasons, today, the inclination to associate professionally among journalists is extremely weak. There are various organizations, but they rarely tend to collaborate among themselves. In terms of a relationship of forces, Bulgarian journalists are very vulnerable to their employers. In Bulgaria, anyone who wants to fight for his own economic and professional interests knows that if he is fired, it will be very difficult to find a new place of employment. Among the many media problems in Bulgaria, probably the most cited is the presence of monopolies: an affirmation which, however, is denied by the principal publishing groups. What can be said about media concentrations in the country? We are lacking reliable data on which to base a solid analysis of the media market in Bulgaria. For example, there is no real data about the actual number of publications by the press. But, above all, there does not exist a maximum threshold of ownership above which we can officially speak about a monopoly position in the media. We urgently need a norm that would clarify this, a specific law for the media sector that is currently subordinated to general norms of economic competition. However, the forces of the status quo have succeeded in preventing this norm from being approved. However, to come back to the question, the affirmations about the presence of media monopolies are currently based on observations which are strong, but suggestive, and therefore difficult to defend before official forums, such as tribunals. Bulgaria has seen a significant political polarization in recent years, resulting in protracted protests and demonstrations that have lasted months. What effect have these developments had on the media? Probably the most visible consequence of the strong political polarization of the last few years has been a parallel polarization in the Bulgarian media. In some ways, we can talk about a “partisanisation” of the greater part of Bulgarian media, who have “colored” themselves politically in a manner far more visible than ever before. The result is that today the only forms of media that continue to give voice to diverse and variegated sectors of the Bulgarian society are the radio and the public television (BNR and BNT). At the same time, the protests were accompanied by a real explosion in social media as an alternative source of information from than the traditional ones…. The explosion of active information-seeking in social media in recent months is a very important phenomenon for Bulgaria. However, the effects of this activity have for the most part remained limited to the internet itself, without influencing in any decisive way the rest of society in its full complexity. This is due to various factors. According to official data, 50% of Bulgaria’s citizens have never used the internet. And, regarding the other 50%, those that use the internet to participate actively in political discussions are a minority. The positive aspect of the explosion in social networks is that they have created a truly new and alternative channel of information, that permits its users to discuss among themselves what is happening in society. On the other hand, the internet is having difficulty fashioning a constructive debate to confront today’s problems and arrive at shared solutions. Bulgaria is a country with enormous differences between its largest cities and smaller population centers. Is this true as well for the media? 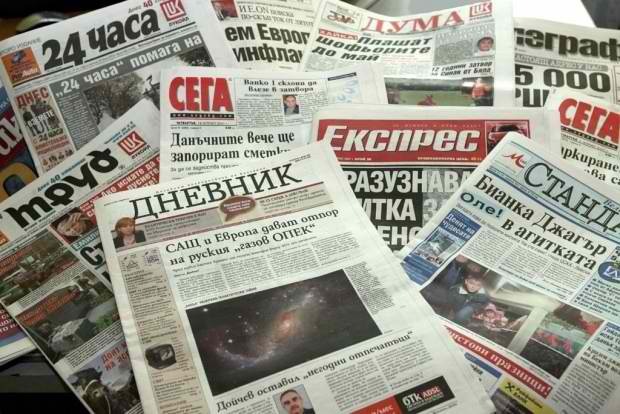 The problems faced by Bulgaria’s regional and local media in producing open and high-quality pieces are even more marked than those confronted by the national media. This is because the regional media has more limited resources, a smaller reference market, and, often, a greater dependence on local economic and political powers. It is extremely difficult to carry out journalism in Bulgaria’s provinces, especially given the country’s strong centralizing tradition, which is true for the media as well. On the other hand, in recent years we have witnessed an ever greater demand for local information, with an increase in dedicated journalistic portals: a phenomenon that is certainly positive. Which media outlets in Bulgaria are the most tendentious and which are the most pluralistic? The published press, also for historical reasons, tends to be the most politicized. Electronic media sources, like television, tend to be more pluralistic. I believe that this depends on various factors. First of all, radio and television communicate and report to a much larger and more heterogeneous public. Of the three most popular television channels, two are in the hands of foreigners, whereas the third is a public sender: a context which limits the capacity of politicians to directly influence the editorial selections. However, in recent years, Bulgaria has witnessed a new phenomenon probably unprecedented on a European level: The birth of partisan television like “Alfa” and “Skat,” respective organs of the national parties “Ataka” and “National Front for the Salvation of Bulgaria.” This is an event which probably bodes poorly for the state of media in the country. *Orlin Spasov is associate professor at the Faculty of Journalism of the University “Sveti Kliment Ohridski” in Sofia. He studies the transformation of the public sphere due to the evolution of traditional and new media. The author of numerous volumes on communications, among which are “Transition and the Media: Politics of Representation” (2000), " Sport and Politics: Media Rituals, Power Games" (2013), " Internet in Bulgaria"(2014, currently being published). He is the executive director of the Media Democracy Foundation (fmd.bg).